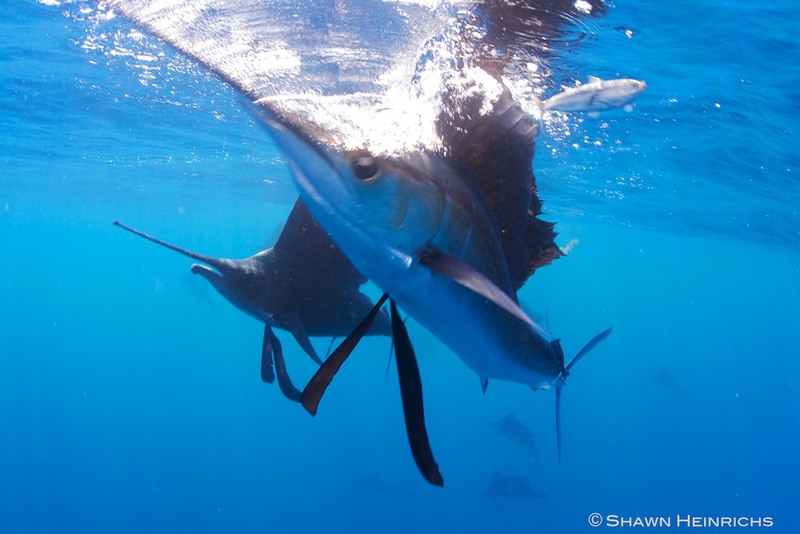 We returned to Isla Mujeres for our 4th season of sailfish action aboard the Lilly M and Andrea M of Keen M International. Captains Anthony, Rogelio and David did an outstanding job as usual. 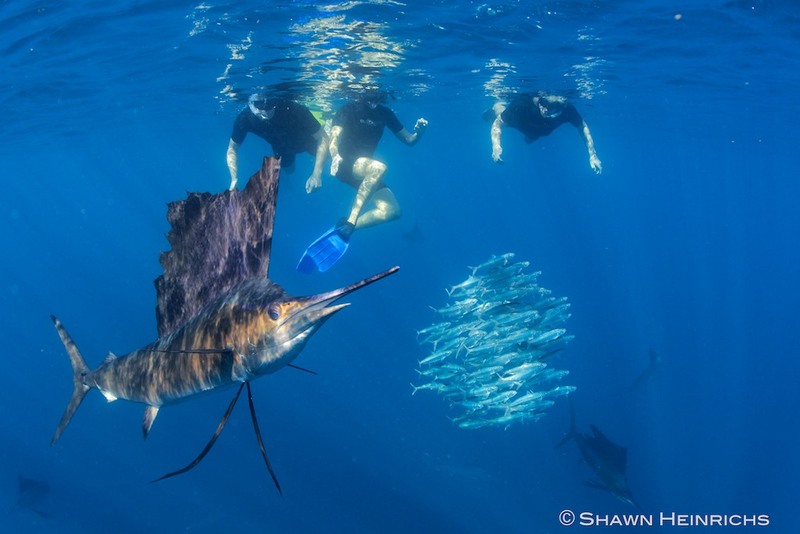 Despite challenging weather conditions and fluctuations in the activity, each trip was huge success with epic sailfish baitball action. 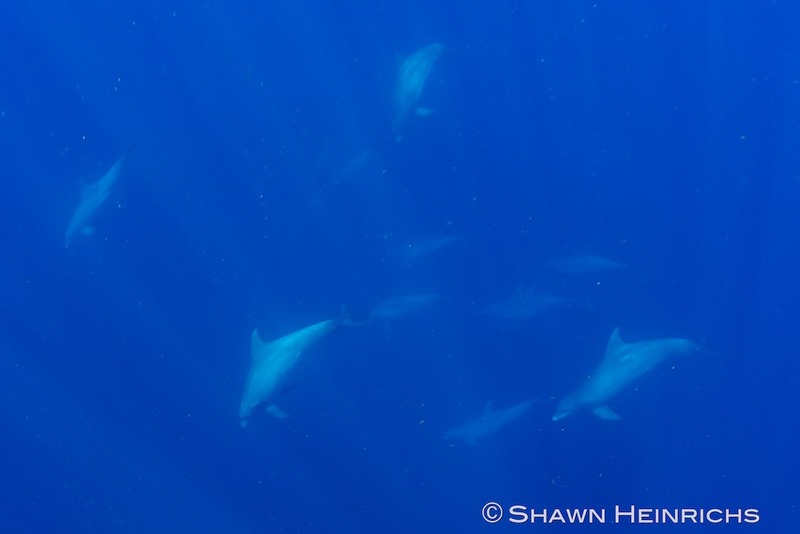 In addition, we encountered many other species of marine life, and scored some terrific interactions. 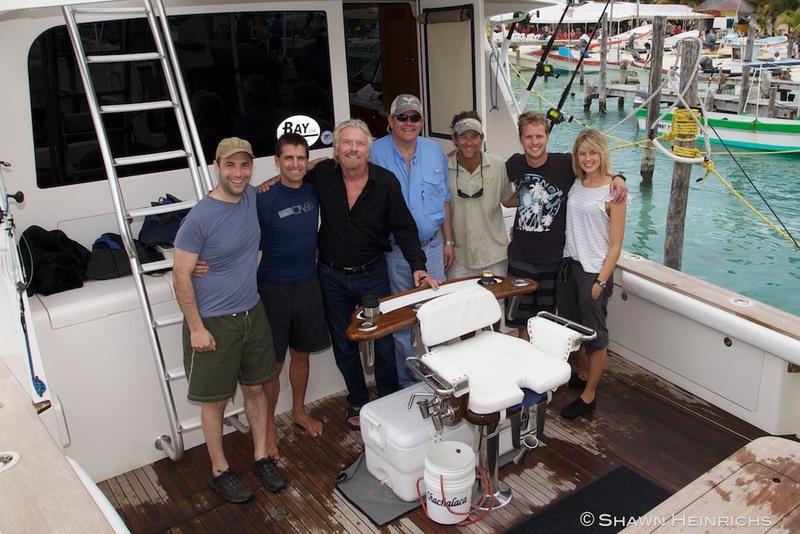 In our first trip, Richard Branson and his family joined us to give the sailfish a try. 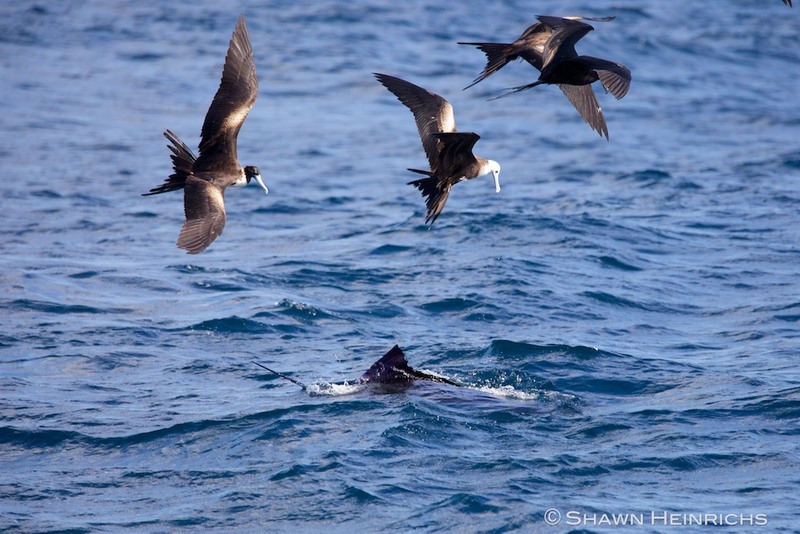 Having already experienced the whale shark aggregations in July, he was ready to turn up the heat several notches and experience one of the most exciting and intense marine spectacles found anywhere in the Ocean. Also with me was my good friend John Petry who was trying his hand at a “Shawn Epic” for the first time. 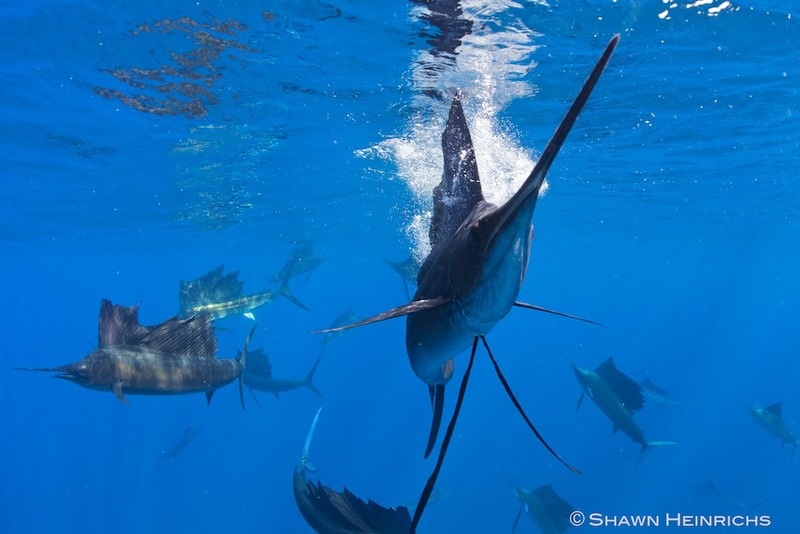 Lawrence kindly invited us as guests to join him on the his vessel the Chachalaca for some incredible action! 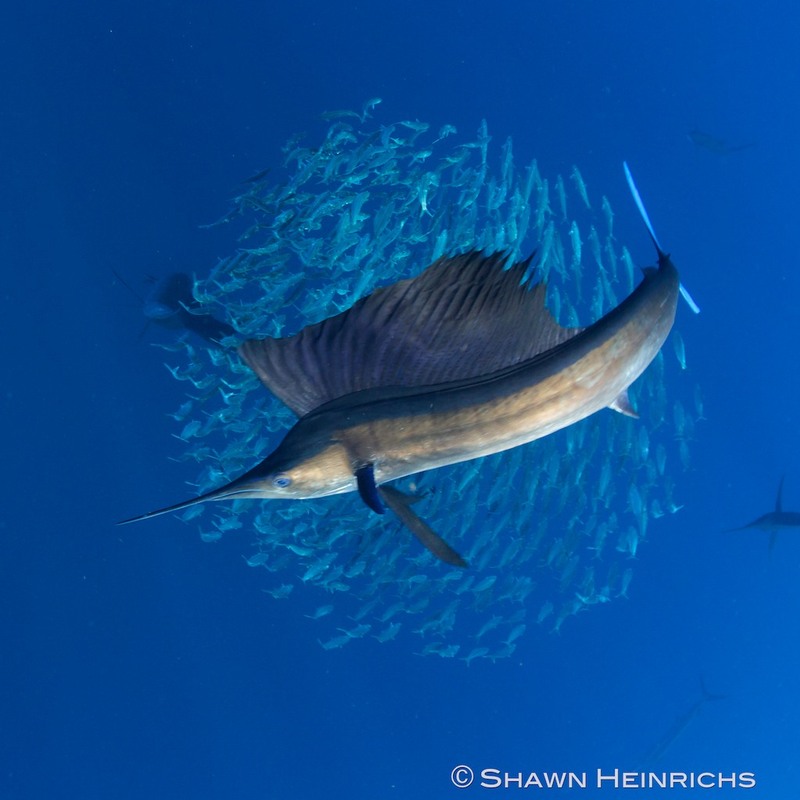 Sailfish makes a very close pass by Richard! 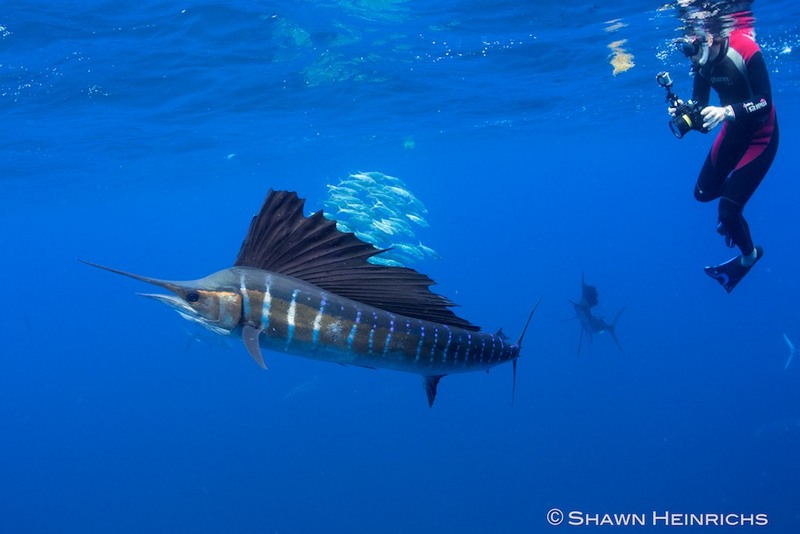 The trip was a huge success with baitballs lasting for hours and sailfish ripping apart the sardines just inches from our masks. We also swam with groups of giant mantas, a whale shark. 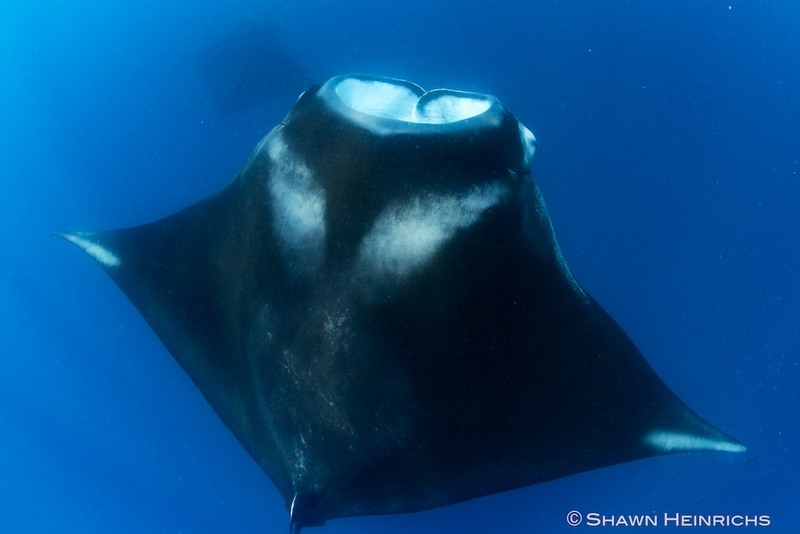 One curious manta decided to give Richard a closer look, coming nose to nose before ducking right under him. 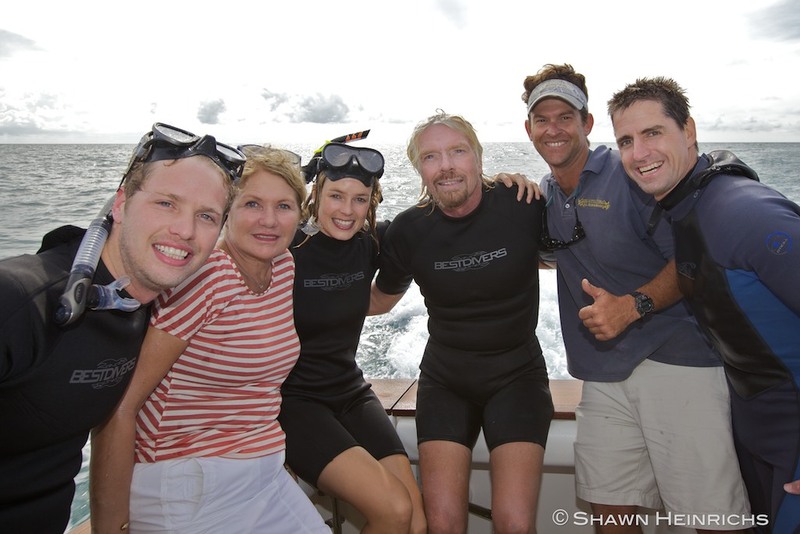 For Richard’s son Sam, his interaction with a whale shark was a first in his lifetime. Everyone left with huge smiles, excited to return to Isla again from more marine mega-fauna activity. Great trip with Lawrence on the Chacalaca...thank you! I also had a second group with me during that first week. Sean Havas, Sterling Zumbunn (Backscatter) and my older brother Brett Heinrichs. The group was incredibly proficient in the water and I even struggled to keep up with the furious pace that we chased down baitball after bait ball. Day one we landed a 3 hour baitball and another 2 hour baitball. Day 2 was much the same. Day 3 and 4 I was off the boat and the success continued without me. Day 5 we regrouped and found sails again, but this time conditions had turned and we called it an early day. Overall the trip was a huge success and everyone came back with epic imagery. On our second trip, David Vic and Debbie, Phil Sokol and Greg Redfern joined me. 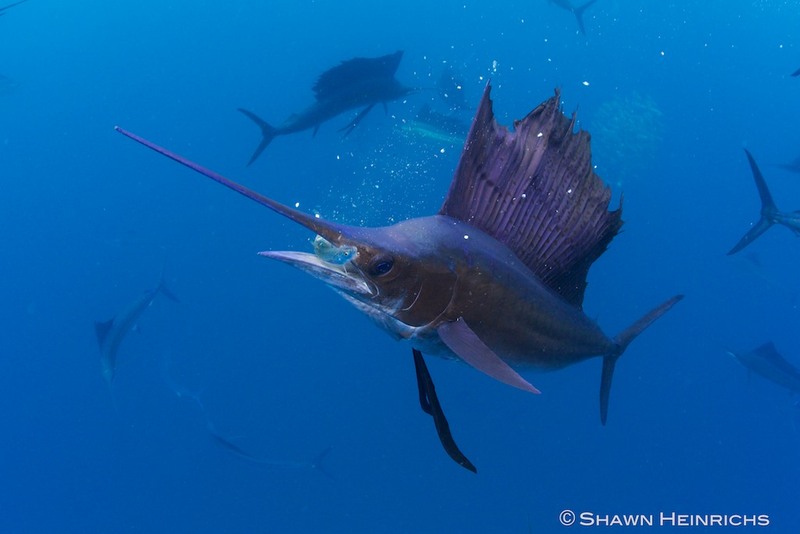 Except for Greg, the entire team were sailfish veterans so I knew we are going to get it done right. With several very slow days from the outset, I was beginning to get nervous. The team however remained upbeat and positive, and on day four we landed the mother load. 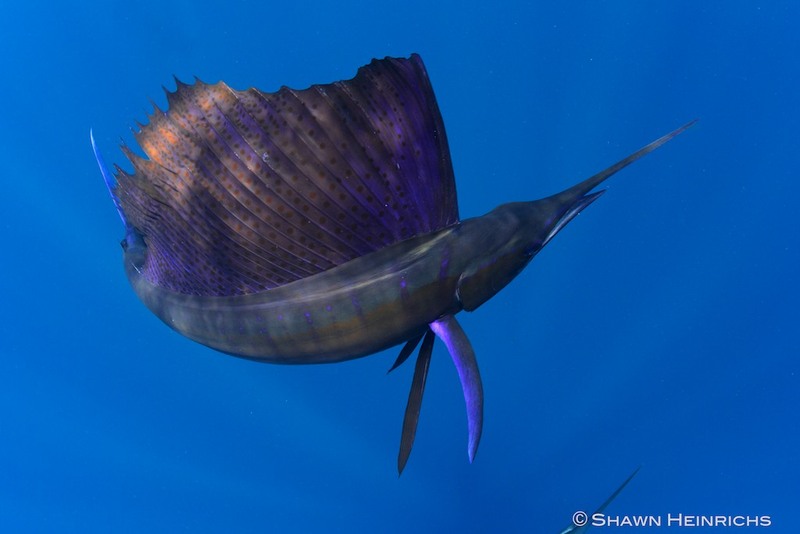 We spent 4 hours on a single baitball (5 hours is my record length baitball )with 75-100 sailfish tearing it apart. The action never let up and we documented the ball whittle down to the last few sardines. Two days later we scored another baitball that lasted another 2 hours, and with 6 hours or intense baitball action for the week, the group left with full CF cards and lifetime memories. Our third and final trip faced just as challenging sea conditions, with persistent winds and upwellings creating green/turbid waters. I was joined by Lupo Dion, and Michael and Nadine Umbscheiden. Unfortunately, Mary O’Malley was booked to come but fell sick the day before the trip and had to cancel. We missed here dearly, but there is always next year! Day one we chased down a baitball and spent 2 hours with it. Unfortunately the waters were green but we still managed some great shots. On day 3 we landed a 2 hour baitball of epic intensity. 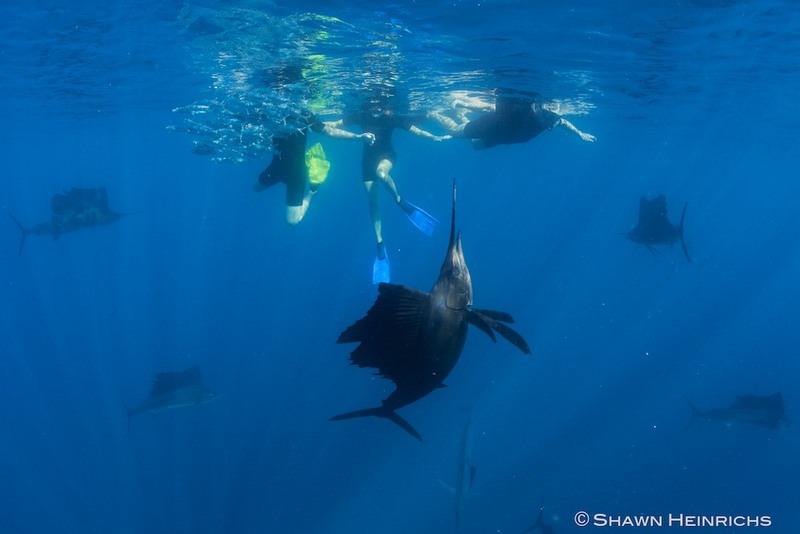 In four years interacting with the sailfish, I have never experienced such ferocious activity. 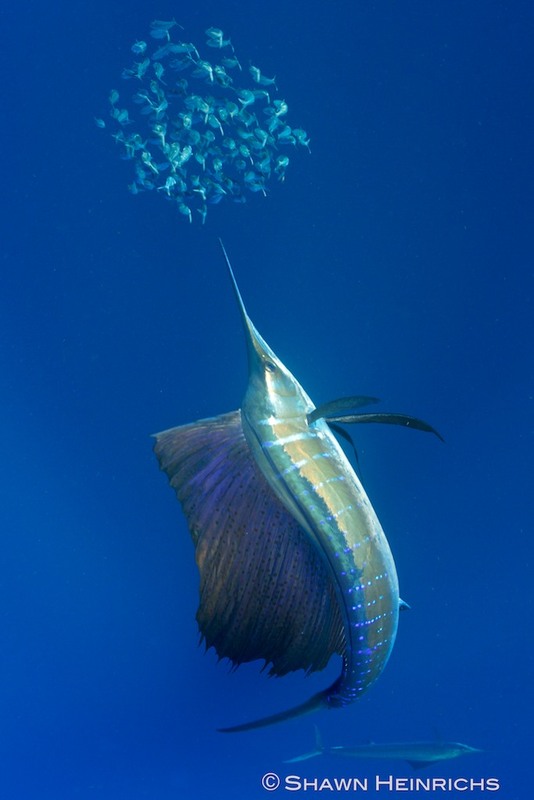 The sailfish boxed in a very tired ball of sardines and set about tearing it apart. The passes were fast, furious and often terrifying. Though the entire group were no strangers to intense bill animal action, I have never seen so many defensive postures and dodges. 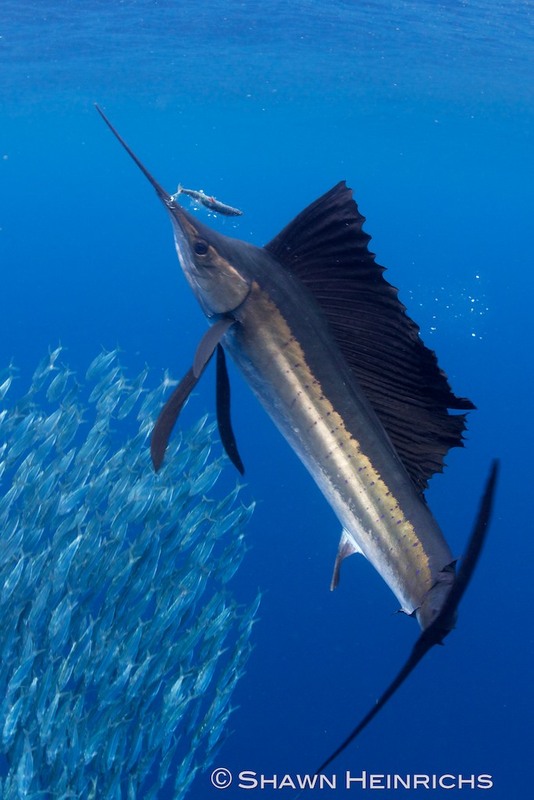 The sailfish would slice off a few sardines from the ball, who would race toward us for cover. 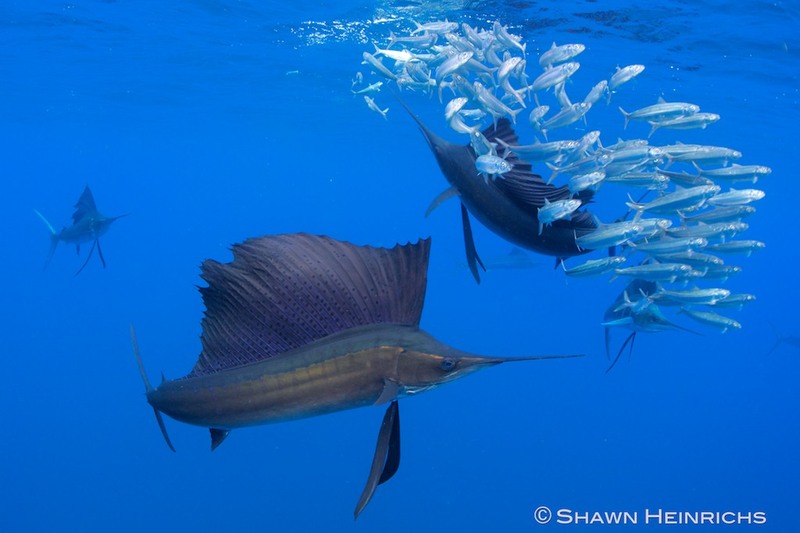 The entire swarm of sailfish would set upon them, charging by us at light-speed as we winced behind our cameras. Way to many close calls for my liking! Day 4 turned out to be especially memorable. While motoring across blue waters in search of sailfish action, we came across 100-150 whale sharks feeding on the surface. 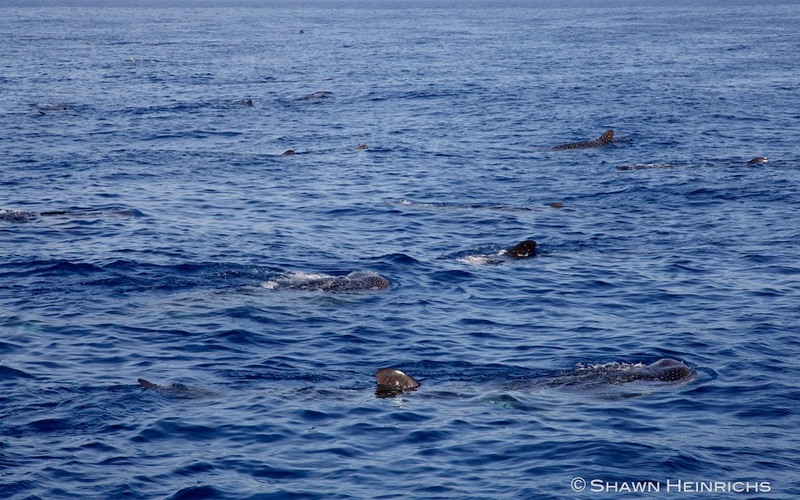 This looked to be exactly the same scene as we witness in July/August during the annual whale shark aggregation here. At this time of year, satellite tagging data indicates that these whale sharks are meant to be at the furthest extent of their migrations from Isla. But here they were? We dove in and discovered the water was full of tiny clear eggs that looked very much like the eggs we see the whale sharks feeding on in July. It was a mystery why the whale sharks have arrived 3 months early, but one thing was clear; we were going to snorkel with them! We spent 5 hours with these majestic animals, filming as groups of whale sharks, swimming up to 5 abreast and 4 deep came cruising by. 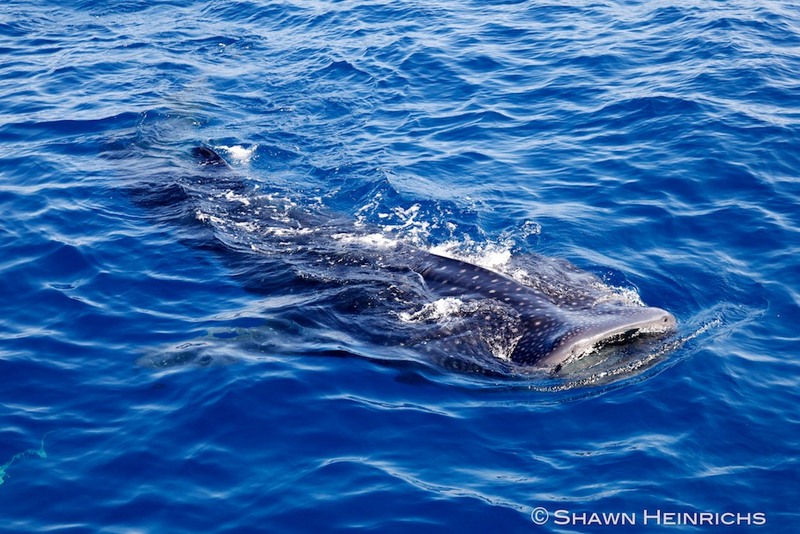 It was an incredible prelude to the summer whale shark trips that lay ahead for us. 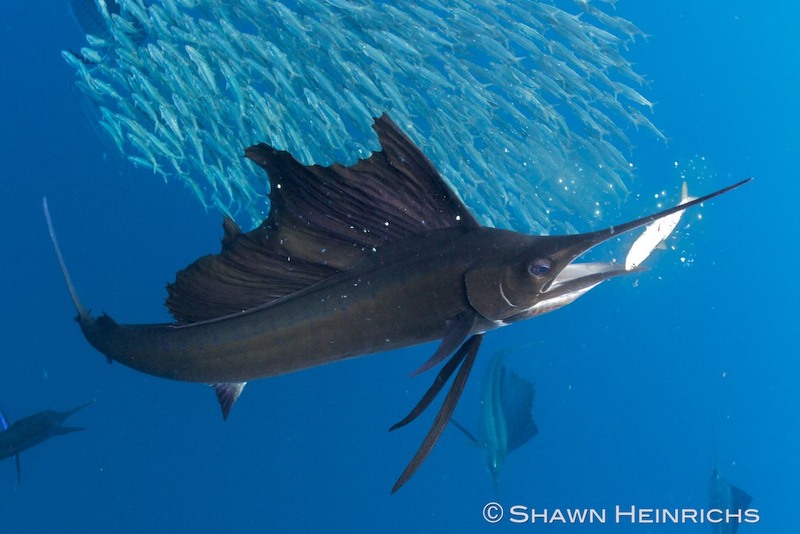 The diversity, quantity and quality of big animal interactions sets Isla Mujeres apart from other locations on the planet. Working in small groups, we achieve the best interactions possible. I can’t wait for next year! There has been a lot of controversy surrounding the recently “discovered” Oslob, Philippines whale shark situation because of the feeding of the sharks that accompanies the tourism. As with all things in life, there are many strong opinions and diverse viewpoints.However, there is much to be learned by opening our minds to alternative perspectives, even if we don’t end up agreeing with that perspective. The saying “seek first to understand, then to be understood” comes to mind, and it was in this spirit that I approached the story of Oslob’s whale sharks. My visit to Oslob was unintended. I came to the Philippines to work with a local advocacy team to help with the new proposed shark conservation legislation. Following this, I was invited down to Dumaguete as guest of Atmosphere Resort to document their conservation work and film some of the spectacular macro life on their reefs. Near the end of my trip, we explored a remote dive site near Oslob, Cebu. Upon surfacing from the first dive, an excited local park ranger approached our boat and announced that the fishermen across the channel had befriended whale sharks. If we were willing pay a fee to the fishermen, we could dive with them. We were both curious and skeptical. We jumped in our boat and headed across the channel to investigate. Upon arriving, we were astounded by the sight of fishermen in dugout canoes, paddling around with whale sharks following behind. We paid 100 pesos per person and plunged in to swim with the whale sharks. Realizing we had “discovered” something unique and special, I decided to spend more time to understand and document the situation. With only my dry bag, cameras and a tub of rice, I hopped aboard one of the dugout canoes and paddled ashore. I spent a day and night with the fishermen learning all I could about the situation. I sat with the local fishermen on the beach under the stars, talking late into the night. I was intrigued by everything they shared with me, including their fishing practices, the history of the whale sharks in the area, and the new whale shark tourism they started. 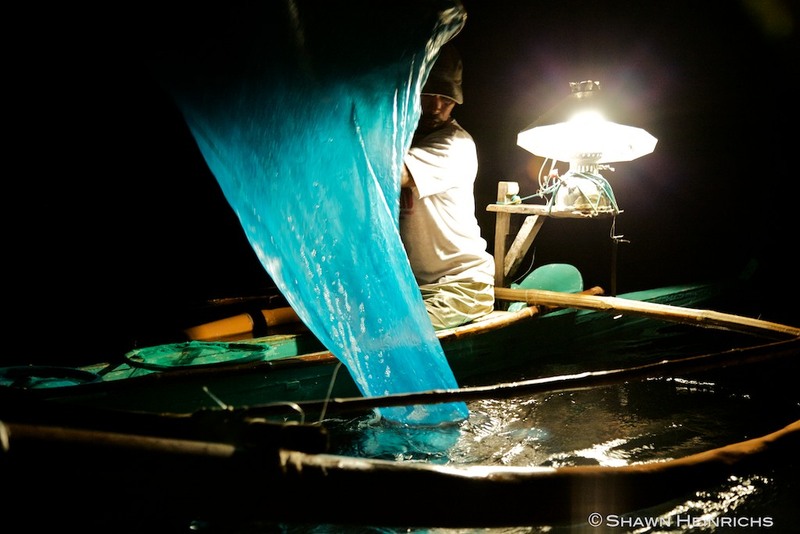 Later that night, I went out shrimp fishing with the fishermen in their dugouts while also observing the natural feeding practices of the whale sharks in this area. What I witnessed shed light on the daytime feeding conducted by the fishermen. Early the next morning, I spent several hours in the water, alone with the fishermen and several whale sharks. It was a very intimate experience that challenged my prior perceptions and opened my mind to new possibilities. The following discussion is based on my direct, personal observations. The whale sharks that come to Oslob are targeting tiny shrimp that rise to the surface at night. These shrimp move in toward the shallows under moonlight. 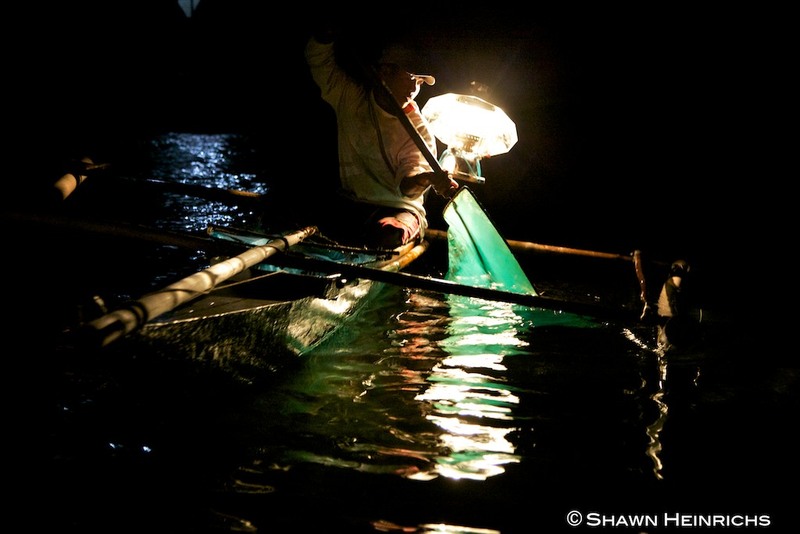 The fishermen catch small quantities of the same shrimp that the whale sharks are eating by using small lights on their canoes and very fine-mesh hand nets (in 1 meter of water). I observed the whale sharks at night in 2-3 meters of water passing back/forth as they fed on the shrimp. It was hard to believe how shallow they were feeding! In the day, the whale sharks were still in the area, possibly waiting for the evening when the shrimp rise again to the surface. 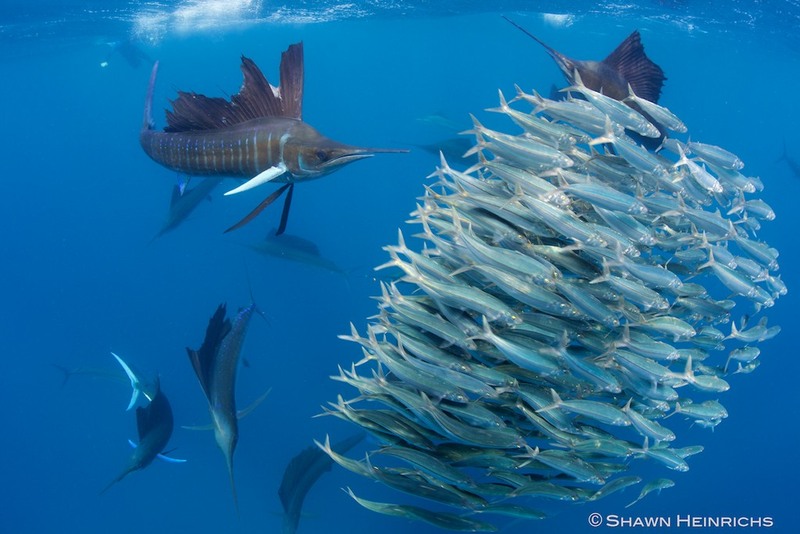 The shrimp that are fed to the whale sharks are not larger shrimp that have been minced, as has been mistakenly reported, but are tiny shrimp that are a natural part of the whale sharks’ diet for this precise area. 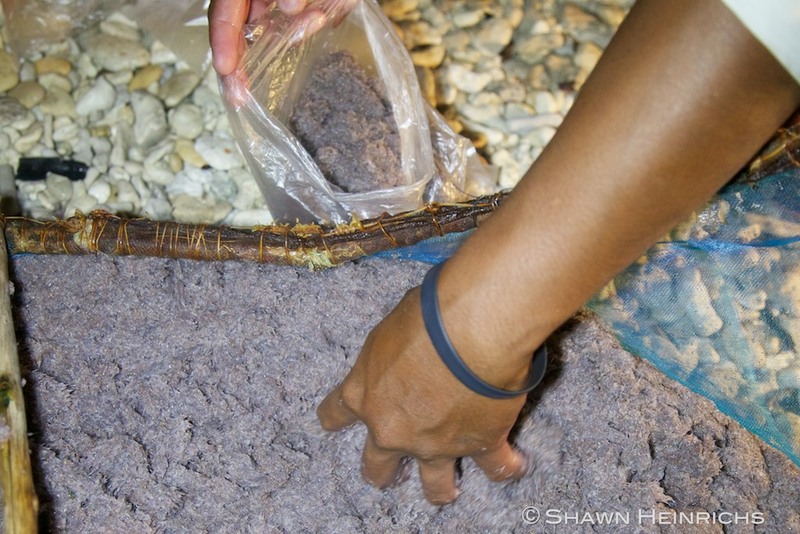 The hand feeding appears to be a small additional supplement to what the sharks eat on their own. 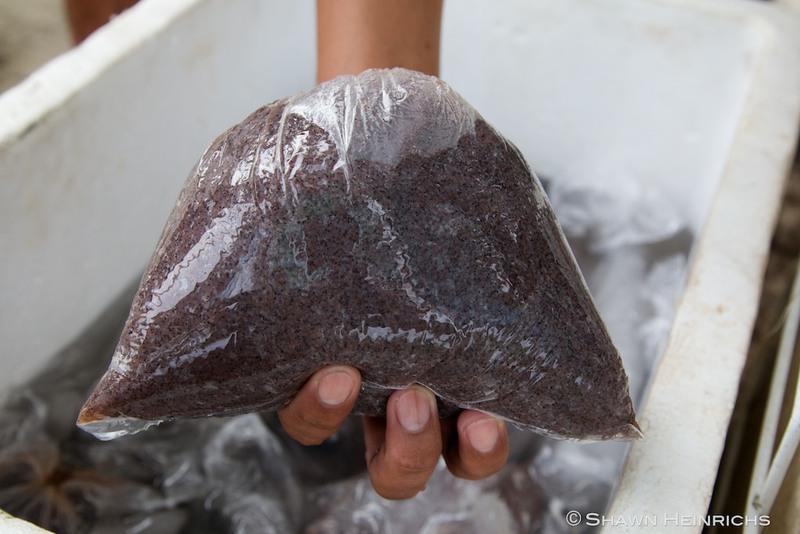 The tiny shrimp are brought ashore within an hour of catching (3am when I was there), packed into sealed plastic bags and stored on ice to keep them fresh for the few hours until they are fed to the sharks. 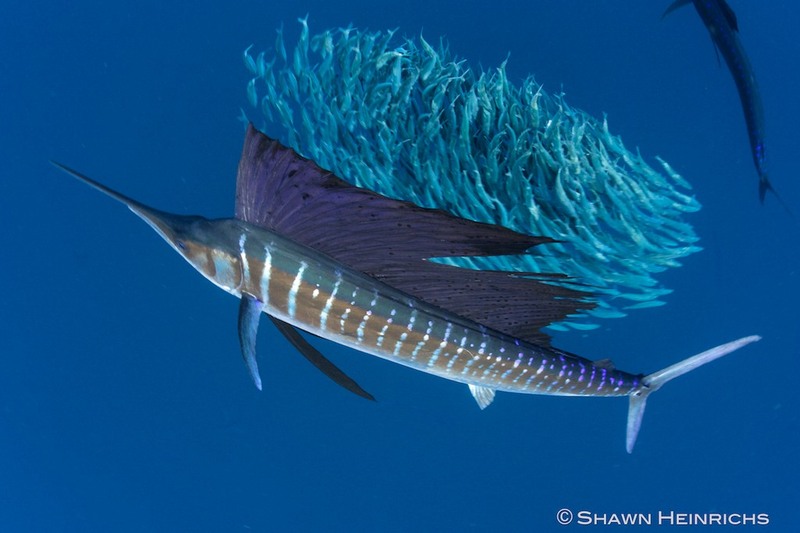 While I did not study the migratory behavior of the whale sharks, it is likely that migration patterns would not be impacted because they still come to feed when the shrimp are available in this area, and leave when the shrimp are not available. 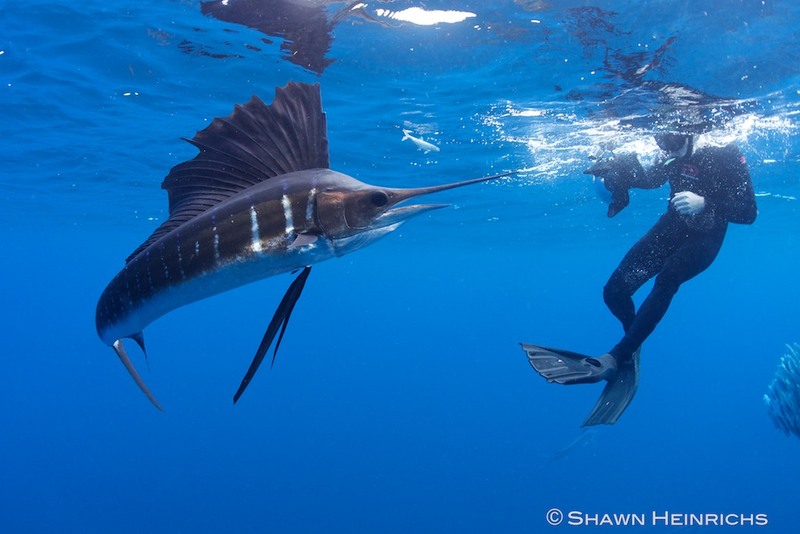 The fishermen report that during full moon phases, the shrimp do not appear and the whale sharks are gone. 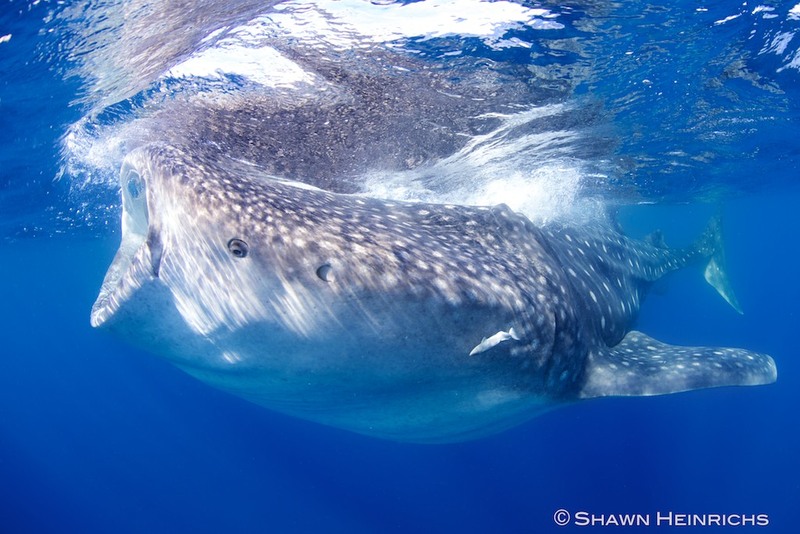 A reasonable concern is that the whale sharks may become habituated to small boats seek possible food handouts. 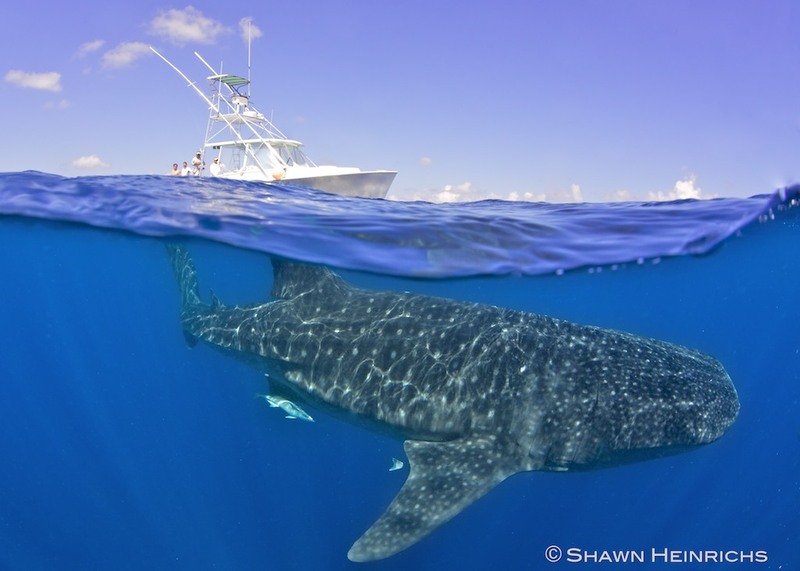 Whale sharks have been known to approach boats in many locations around the world already, sometimes relating to fishing methods, rather than tourism-related feeding. It remains unclear whether or how tourism feeding has any longer term impacts, but I suspect this issue needs a further look. Guidelines should focus on managing the number of boats and guests at any given time in the water interacting with the sharks. In many places, the “one boat per shark” rule makes a lot of sense, with a limit of number of guests per shark. If motor boats are being used (they are not in Oslob), the boats should not gun their motors to approach a shark when sighted and the boat should keep sufficient distance from the shark to reduce the chance of maiming the shark with the propellers. Riding and handling of sharks should be prohibited. Though riding on sharks has been reported in the past at Oslob, the new regulations prohibit this. In the case of Oslob, the whale sharks are feeding on their natural prey but certainly not in a natural manner because they remained mostly stationary and upright. My observations were that they cared little for divers or snorkelers and even approached them without concern. 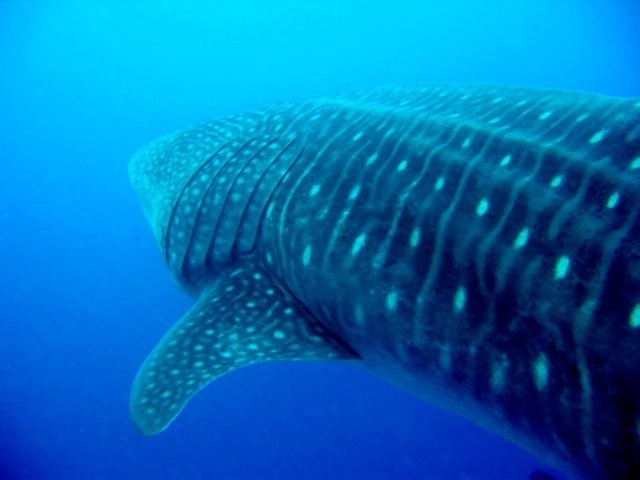 Another controversy is whether SCUBA diving or snorkeling is the preferred means of experiencing whale sharks. Some suggest that diving negatively affects the animals. 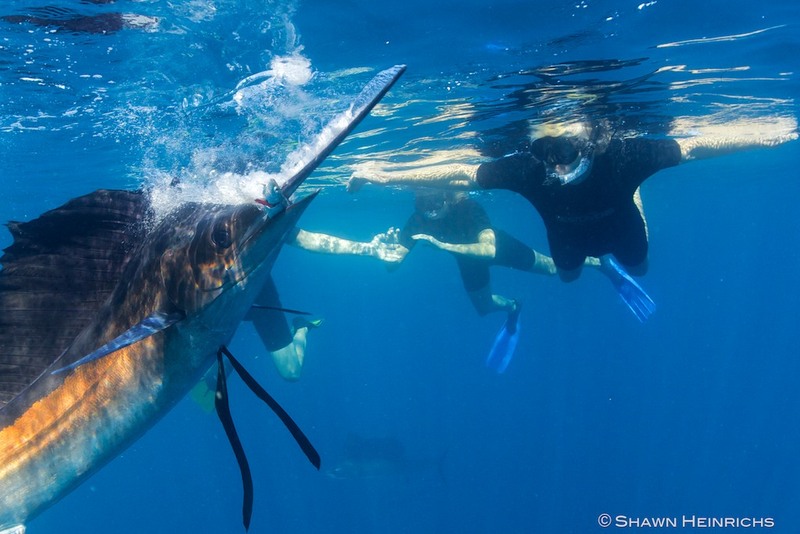 However, there are many locations around the world, including Galapagos, Cocos, Seychelles, Maldives, Mozambique, Thailand, where diving with whale sharks is endorsed and promoted and does not seem to have any negative impact. 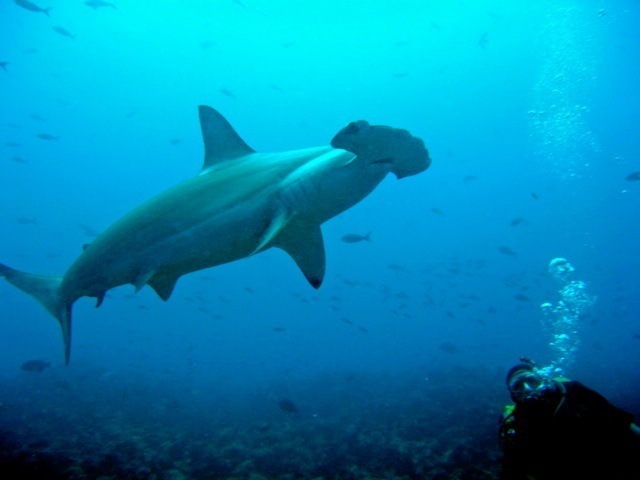 Diving does raise the issue of diver safety when divers must share the open water with boat traffic and moving animals. 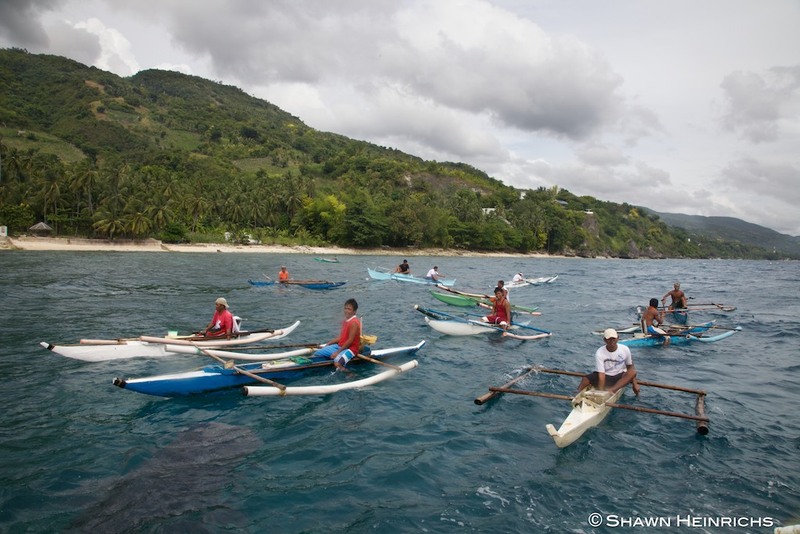 In Oslob, however, both the whale sharks and the boats are remaining in relatively fixed positions. There is no need for divers to make rapid ascents. A second issue relates to the animals using the water column to create breaks from tourists. In Oslob, the animals are generally stationary at the surface and in shallow water. As such, there is no need, intention or even possibility for the animals to move way or seek space. At the time of my visit to Oslob in early December, 2011, the whale sharks were only known to a few local operators and no regulations of any type were in place. While concerning, visitor traffic was still minimal. After I completed documenting the extraordinary situation at Oslob, I requested that all members of my dive group not publicize the Oslob whale sharks until such time as I could help the implementation of proper guidelines. I was concerned that if the world found out about Oslob, the situation could spin out of control. I submitted my findings and recommendations to the parties involved in establishing the regulations. 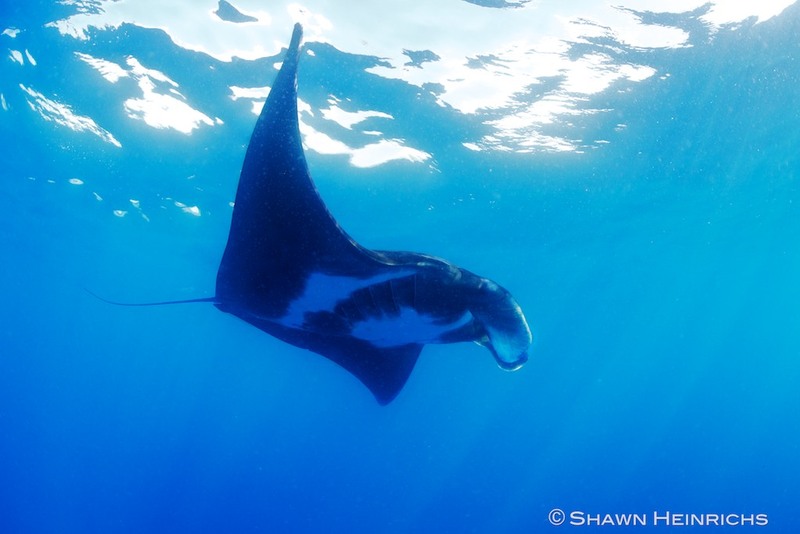 I collaborate with many of the top marine mega-fauna researchers, and I have extensive experience dealing in the management of tourism interactions with whale sharks and manta rays in locations around the world. I also work closely with fishing communities in remote locations around the world helping them foster development of tourism opportunities (as apposed to destructive fishing). When I landed back home in the USA, I discovered that a Philippine newspaper had just run a feature on Oslob’s whale sharks. A brief search of the internet revealed blogs and images popping up everywhere. The story was out. In the face of what I considered to be rampant hearsay and growing speculative commentary, I made the decision to release my story to the press. Motorboats are prohibited in the area. Only paddleboats are allowed. A maximum of six tourists is allowed to view for 30 minutes while a maximum of four divers is allowed to avoid crowding. There has been widespread criticism that the regulations, after just a few weeks, are being ignored and not properly implemented. We must bear in mind however, that these regulations have just been implemented, and that this village has very little experience with tourism management. As such, they are starting with minimal infrastructure and training is in place. It takes time, commitment and support to properly implement regulations and socialize them within communities, and for us to continue to reinforce the importance of these regulations being applied effectively. In my opinion, the above regulations are some of the strictest in the industry with regard to whale shark interaction. 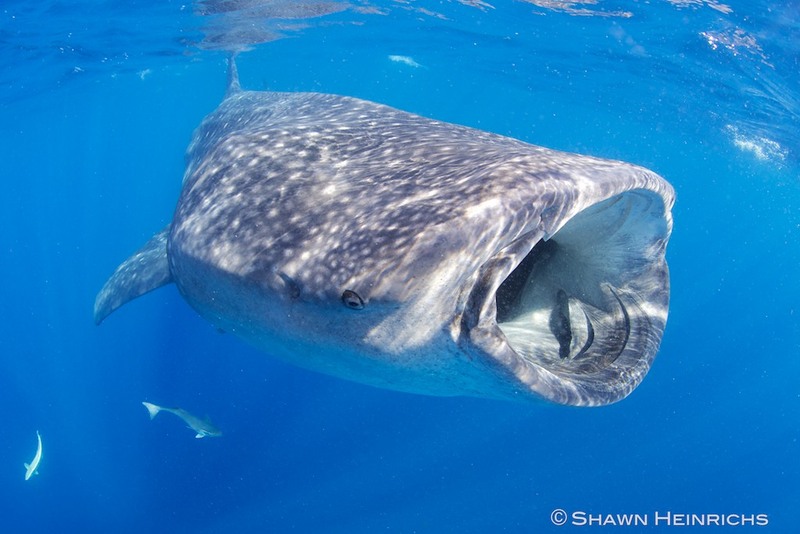 In Donsol, Ningaloo, Thialand, the Maldives, parts of Mexico, and most other locations, far more tourists are allowed to interact with the whale sharks. 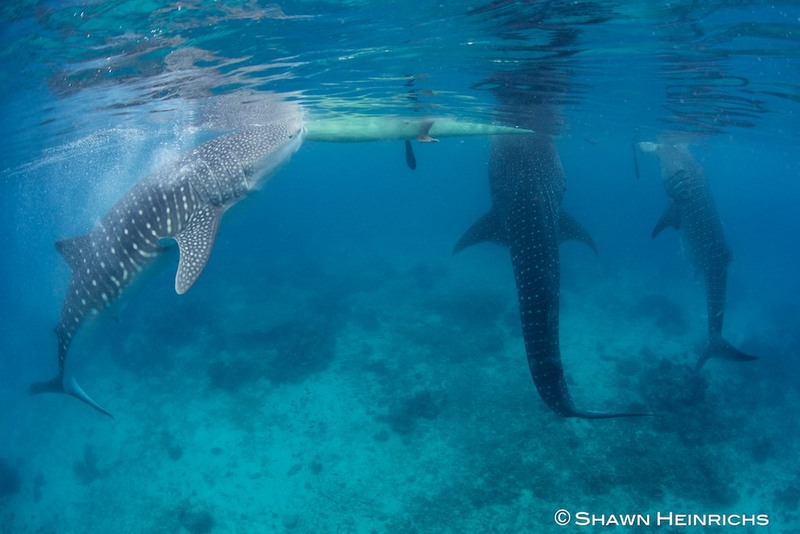 Furthermore, in these other locations motorized boats often run intercepts on the whale sharks to drop tourists as close as possible to minimize their swimming. The consequences are self evident, as whale sharks in these areas frequent exhibit scars from propellers and chopped dorsal and tail fins. Having spent time photographing in these areas, I find it is difficult to produce an image of a whale shark that has not been injured. I wouldn’t want to stop (and in fact endorse) the whale shark diving in these areas, but instead offer these examples to help us shed a fair and honest light on the Oslob situation. 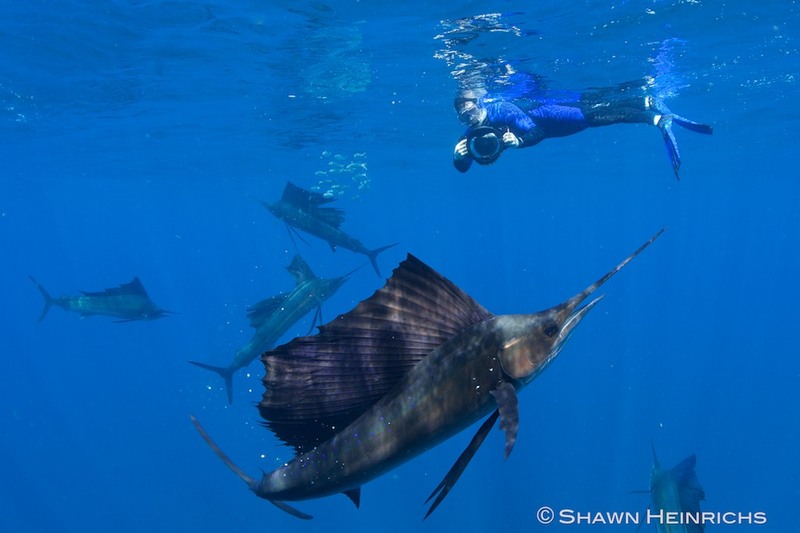 Many of us in the diving and conservation community care deeply about these animals, as well as the opportunity to experience them. There are different ways and places to experience sharks. Seeing the controversy the feeding of these sharks has caused, I realize that we may all share a passion for these animals, but may still disagree on what the graver concerns may be. 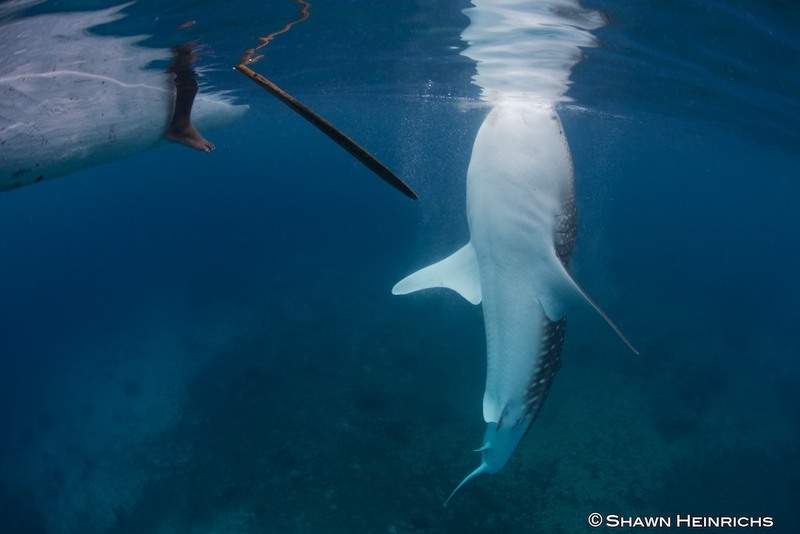 I’m personally disheartened that the outcry over the feeding of these sharks has been louder than that over the illegal slaughter of manta rays in this very same region. The greatest and continuing concern remains the killing of these animals. The history in this region has been one where whale sharks have been targeted and slaughtered for fins and meat, both before and since the ban. 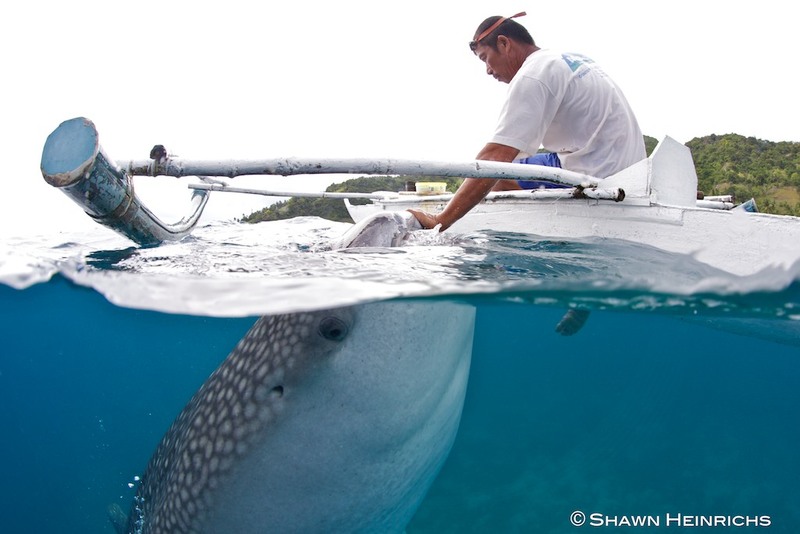 Some villages of Bohol have systematically targeted whale sharks and largely wiped them out in waters of the region. The fishermen in Oslob related that up until a decade ago, dozens of whale sharks were prevalent in their waters throughout the year and regularly encountered during their fishing. 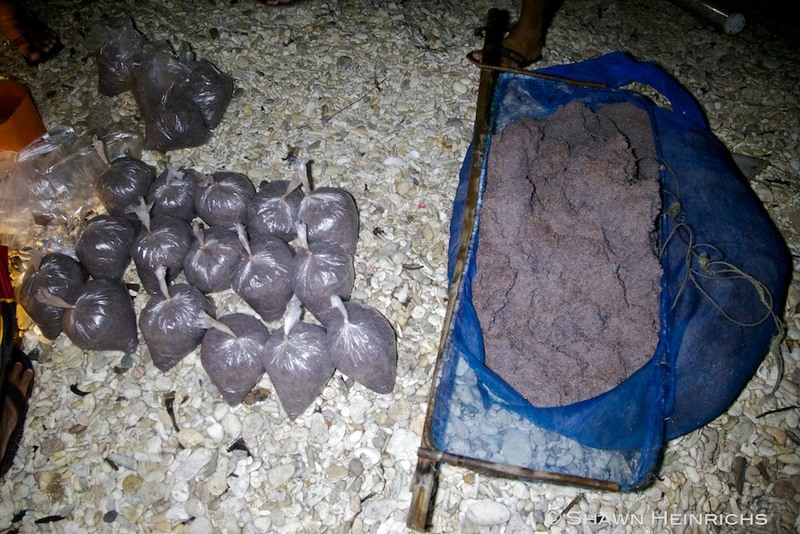 Fishermen then came from Bohol and slaughtered large numbers of whale sharks for their fins. Once they were done, the whale sharks were gone. Now a decade later, some have returned. While the Oslob village was not the killers, they are only now valuing these animals alive and the fishing community has a stake in the conservation of these whale sharks. Let’s celebrate this progress while at the same time working towards proper management and interaction practices. 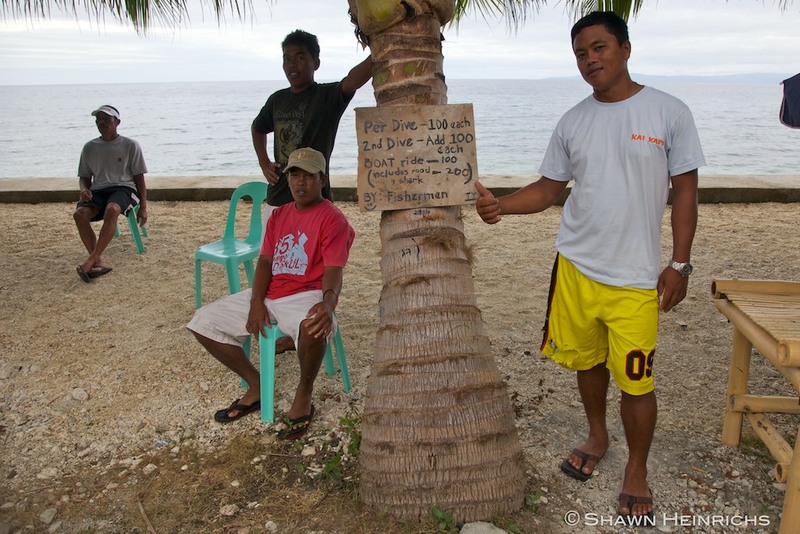 We have an opportunity in Oslob to work with this fishing community (not against it), to help them foster more responsible interaction practices. These fishermen expressed true affection and appreciation for these animals, and are eager to develop tourism while maintaining the well being of the whale sharks. 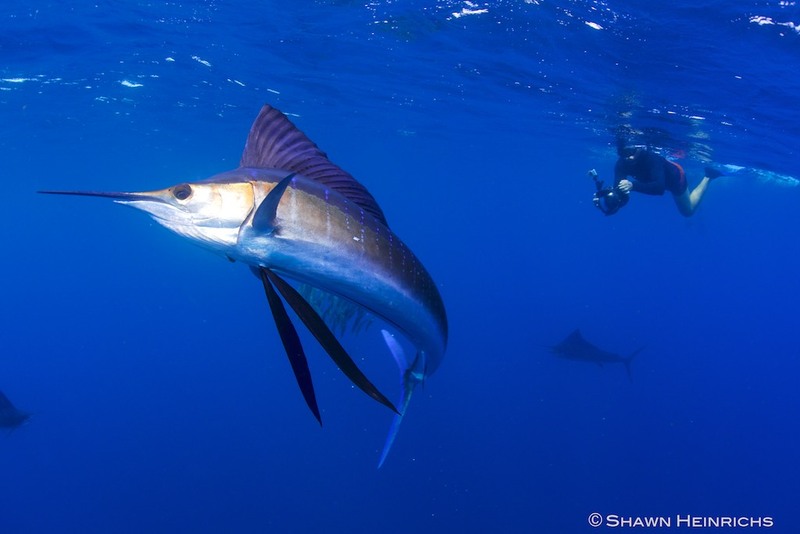 Rather than become embroiled in debate and criticism, we should be a positive force in helping that happen, because the bottom line is, the greatest threat to these animals is directed fisheries and not tourism. 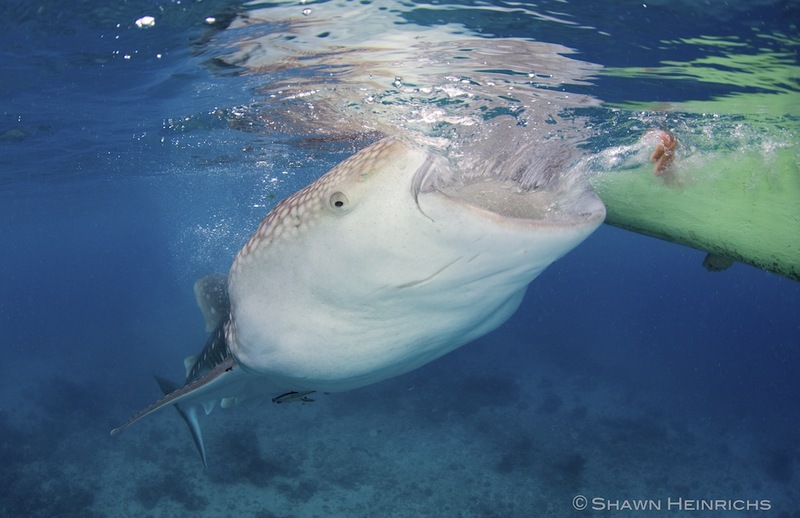 This May we began work on a 3 part series call “Gathering of Giants – Whale Sharks of the Meso-American Reef”. In three special locations along the Meso-American reef, whale sharks gather in numbers during certain times of the year, creating some of the most impressive marine aggregations found anywhere on Earth. What draws them here? Where do the come from and where do they go? And, what is being done to protect them? 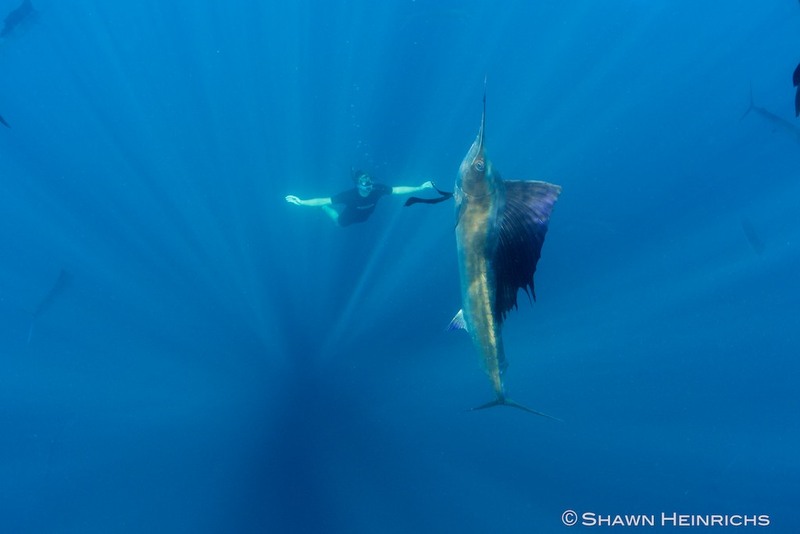 The target audience for this film is conservationists, dive tourists, eco-tourists and adventure travelers. We travel to Gladden Spit Belize, Isla Mujeres/Holbox Mexico and Utila Honduras to document in full HD, the amazing aggregations of whale sharks. 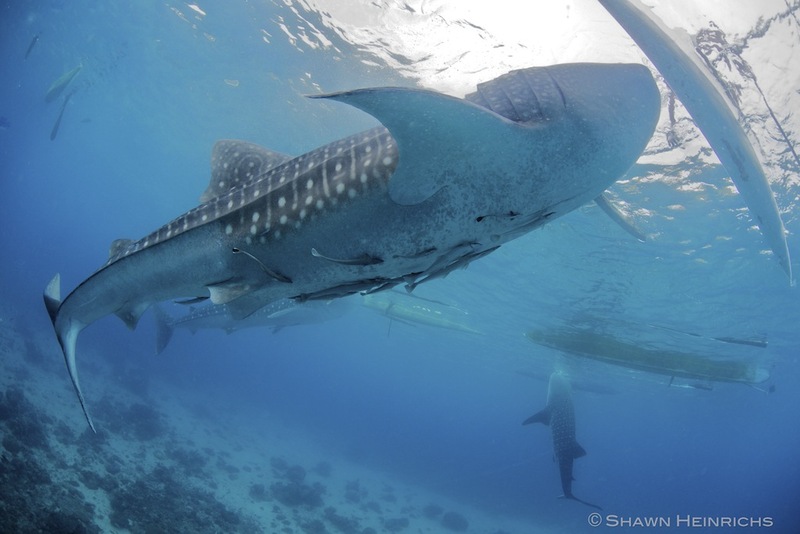 Through first hand documentation and interviews with researchers and park rangers, we reveal what draws these gentle giants to these special locations and unravel some of the mysteries of where the whale sharks come from and where they go to. And finally, we learn about the measures that have been put in place to ensure these aggregations continue into the future. The goal of this film is to reach a broader audience who will be captivated by the impressive footage of the whale shark aggregations and will also learn how easily these aggregations could be destroyed. We will highlight how certain organization and individuals are working hard to ensure that never happens. Through engaging visual footage and inspiring conservation stories, viewers will be motivated to get involved and support future measures to protect these gathering places. Our first stop on the journey takes us to Gladdens Spit, Belize, where 10’s of thousands of snappers spawning attract dozens of whale sharks. Working in partnership with SEA and The Nature Conservancy we are able to shoot some amazing footage and learn a lot about the behavior and migrations of the snappers and whale sharks. 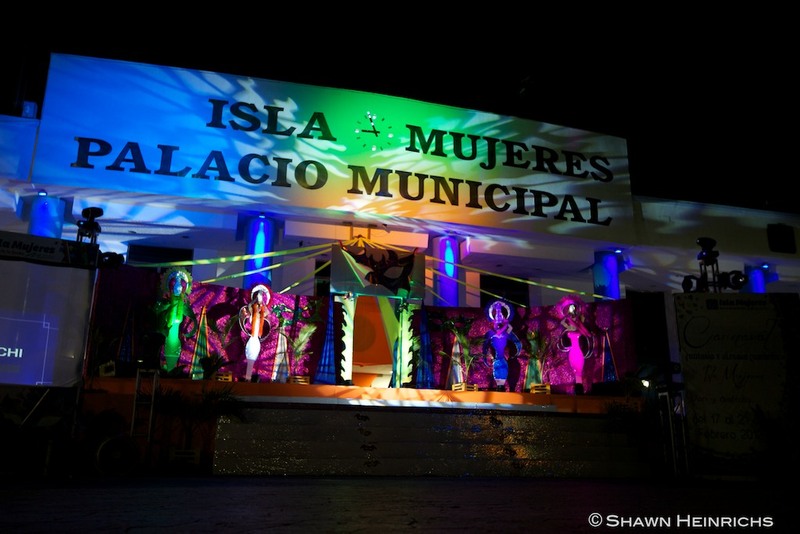 We created a short promo video as a thank you to Isla Marisol Resort for all their support! Our second stop on the journey takes us to Isla Mujeres, Mexico, where over 400 whale sharks were discovered feeding on fish eggs. It was an event never before documented! On our last day in Isla Mujeres, our friends from The Nature Conservancy joined us to experience the sharks. In addition to an exhilerating day of whale shark interactions, we documented the scientists fish egg collection efforts and learned more about the science and conservation initiatives in this area. We created a short promo video as a thank you to Keen M International for all their support! Donsol is a quiet fishing village in the Sorsogon province of the Philippines. 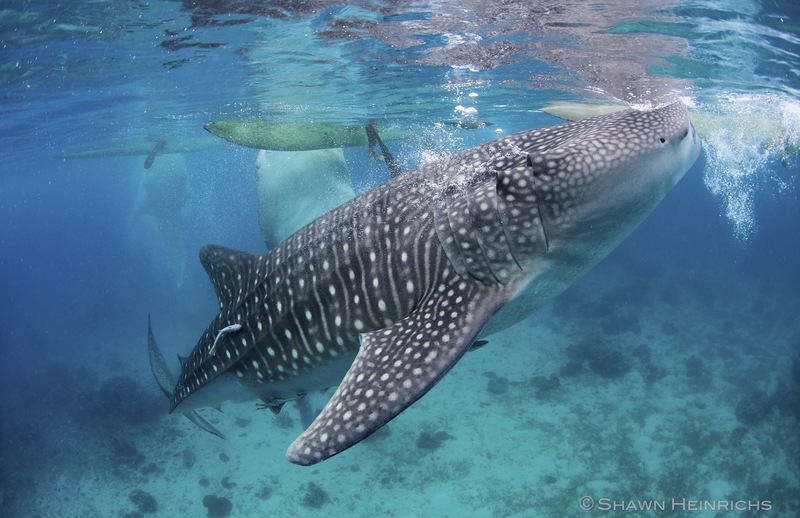 In 1998 whale sharks were discovered feeding in the plankton rich waters along the cost of this village. Since that time, it’s reputation has to spread far and wide, bringing snorkelers from all over the globe to swim with the gentle giants. Whale sharks gather here in such numbers it is hard to fathom. 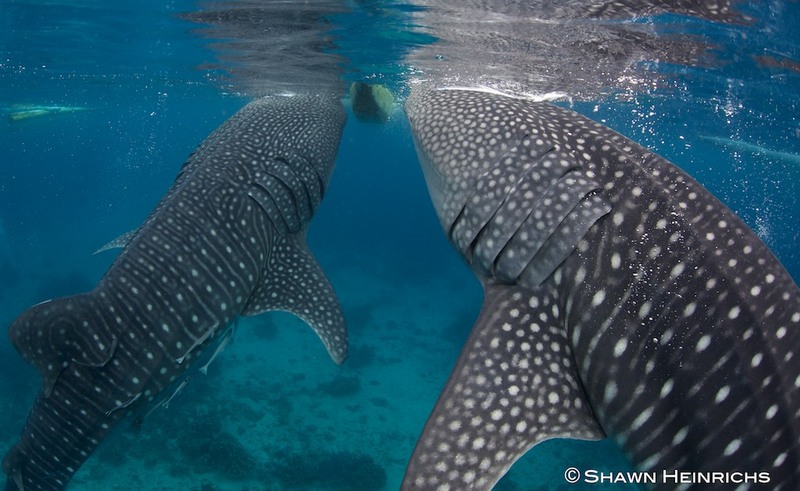 It is estimated that as many as one thousand whale sharks maybe present during the peak of the season. Food, location and temperature all play a role in creating ideal conditions for the sharks. 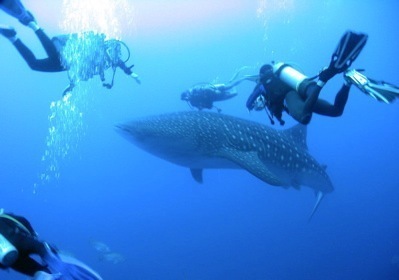 During the high season from December through May, encounters with whale sharks are all but guaranteed. Conditions are challenging with often 3-4 meters of visibility (sometimes less). This is a snorkeling only location as one must jump in and out of the native crafts dozens of times in pursuit of whale sharks. Encounters are brief but can be very close and personal. Shooting video and taking photos is a daunting task as you have to enter the water with cam running and hope to get to the right spot to get the shot. If you are lucky, you may stumble on a shark in “relatively” clear water (4-5 meters visibility). 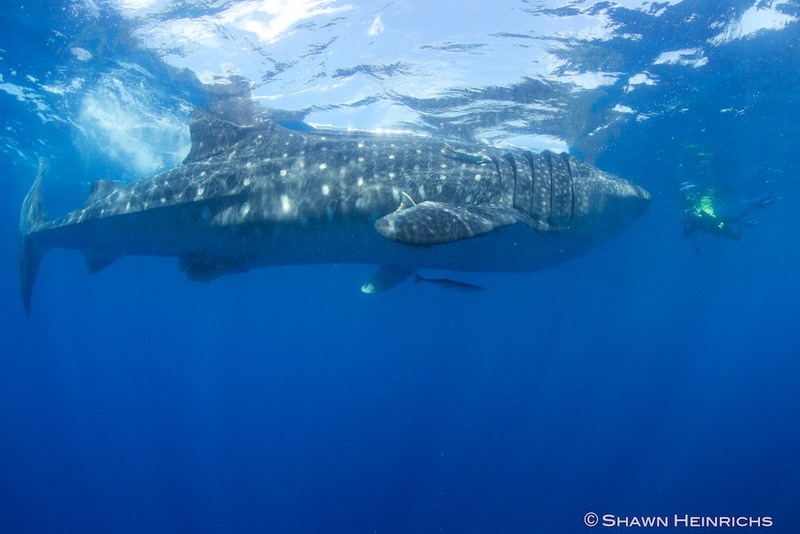 We spent 3 days during the full moon in April in search of whale shark encounters. In these three days we enjoyed over 45 encounters with at least 30 sharks. The good news about the full moon is that the numbers of encounters increase, the bad news is the visibility can be quite poor. April also tends to be peak viewing season. The sharks are present all year but the rain and wind in the “off” season make surface spotting all but impossible. Successful spotting requires sun (to locate the dark shadow on the surface) and low wind (to remove surface chop the breaks up the shadow). WIth so many tourists and money to be made for the locals, Donsol’s popularity is rapidly increasing.That being said, during peak viewing season it was still surprisingly quiet. The good news for the sharks is that increased tourist dollars means more chance for the sharks survival. 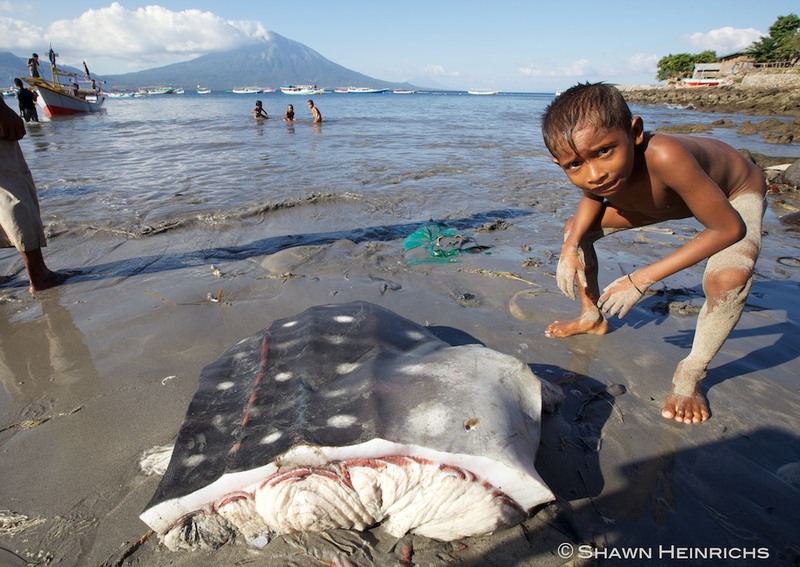 The Philippines have been hunting and exporting whale sharks for years. In Donsol They are worth more alive than dead. Boats full of tourists certainly interfere with and annoy the whale sharks, however it is the only thing preventing their slaughter by poor fishermen. We were happy to contribute our US dollars to this cause. 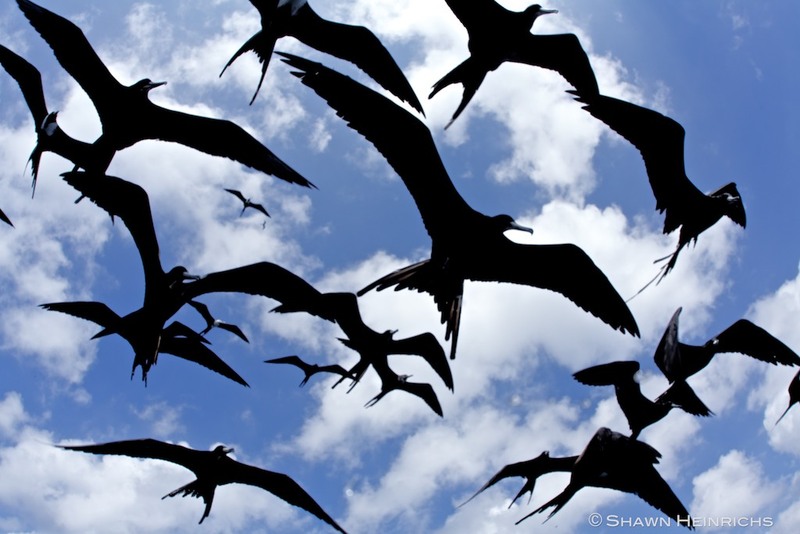 Located 600 miles off the coast of Ecuador straddling the equator, lies the volcanic archipelago of Galapagos. Formed 90 million years ago and composed of 14 islands and 107 islets, Galapagos is one of the most complex oceanic archipelagos in the world. 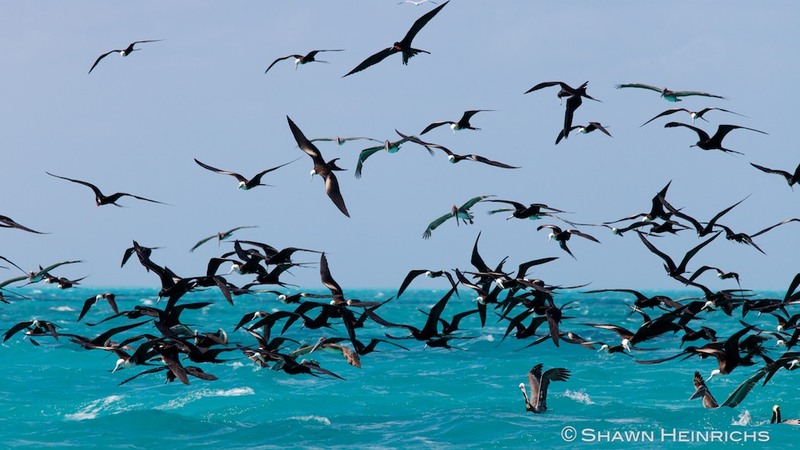 A Biosphere Reserve since 1995 and a World Heritage Site since 2001, these remote islands attract some of the most abundant and diverse gatherings of pelagic marine life found anywhere on the planet. This was our second visit to Galapagos and we were just as excited as the first time. Our sights were on Darwin, the northern most island of the Galapagos with the famous rock arch protruding from the waters. Below those arches, the waters are boiling with sea life. 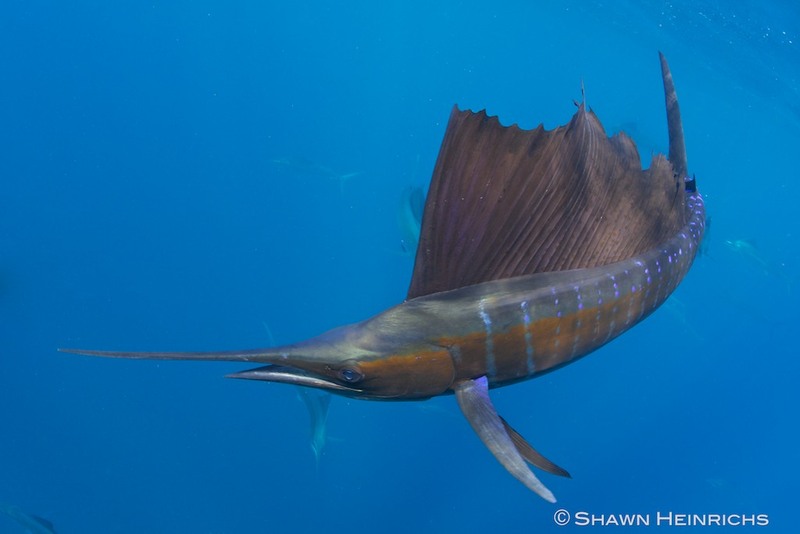 Hammerheads, galapagos sharks, black tips, silkys, dolphins, eagle rays, green and hawksbill turtles, wahoo, tuna, jacks, mackerel, seal lions, dense schools of creole wrasse, and the biggest of the biggest of all fish, the whale shark. As hoped, Darwin delivered on all of the above. Because of the Spring Tides, visibility was quite poor. The density and proximity of the sea life made up for this however. We enjoyed incredibly close encounters with hammerheads swimming within arms reach. To top it all, we had several whale sharks come gliding through the group like freight trains, the largest being a pregnant female over 10 meter long! Galapagos is not just about the big stuff. At the island of Bartolome, the northern most penguins in the world have made their home. There are perhaps several dozen of these cute little birds in the Bartolome flock. They are elusive and hard to spot. A snorkeling encounter with one or two is a treat. We had the great fortune of stumbling upon a mini baitball of glass fish being herded but two dozen of the penguins. The penguins were darting and twirling as they drove the ball to the surface. Sea lions swooped up from below to get in the action while pelicans and sea gulls plunged from the air into the waters with mouths wide open. All of this activity was generated by these wonderful little penguins. 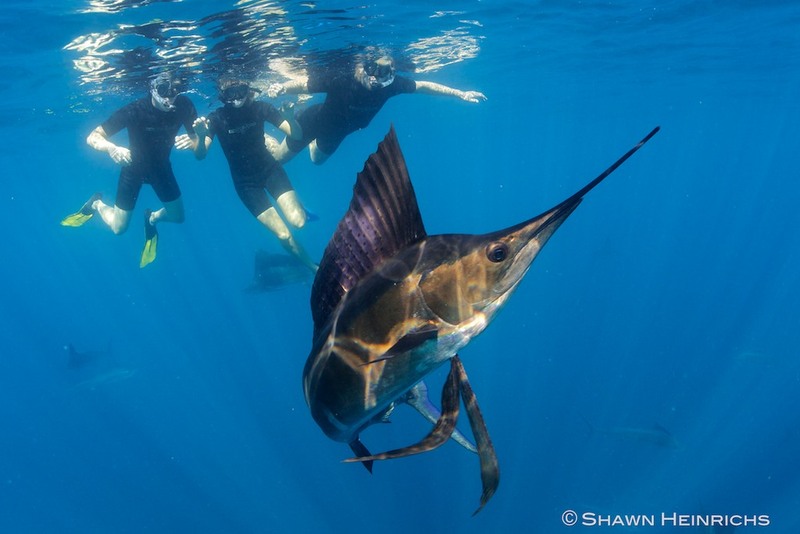 After swimming through dense schools of hammerheads, beefy galapagos sharks and behemoth whale sharks, we thought nothing more on the trip would would catch our attention. We never would have guessed that these little penguins would be the crescendo. We had planned the trip for almost a year. Nick and Heather had traveled from the other side of the globe to get here. Most had used precious vacation time for this opportunity. As much as we tried to pretend otherwise, we were here for one reason alone…to witness the spectacular gathering of the largest fish in the ocean…whale sharks.